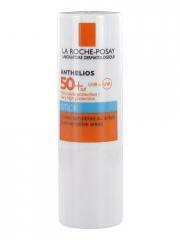 La Roche-Posay Anthelios XL SPF 50+ Stick Sun Sensitive Zones 9g is fragrance-free and paraben-free. It is water proof. Extremely well tolerated, it is tested under dermatological and ophtalmological control. It protects the most sensitive zones, overexposed or forbidden of sun-exposing. Apply every 2 hours and after bathing, perspiring or towelling. Indication: Sun protection of the most sensitive zones and/or forbidden to sun expose. Caution: The sale of La Roche-Posay Laboratory products is limited to the European Economic Area and to 6 units per day and by customer. Use it around my eye area. A little goes a long way and does not cause any irritation.